City of Amsterdam / Max Bögl Nederland B.V.
A unique project: a car park underneath the existing watercourse directly next to the Museum Quarter. 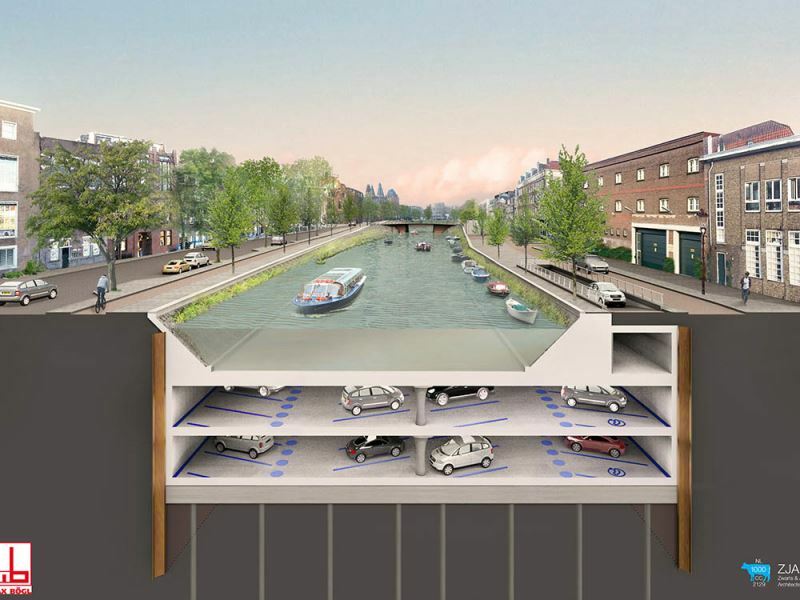 Under the authority of Amsterdam’s city council, Max Bögl Nederland B.V. is building a car park underneath the canal Boerenwetering. Parking facilities with spaces for over 600 cars and 60 bicycles. Efficient use of the limited available space in the Oude Pijp is the leading principle; the new Albert Cuypgarage will diminish the parking pressure and creates more green spaces, pedestrians and cyclists in the neighbourhood. This is the first time a car park was built under one of the canals in the capital city of the Netherlands. An impressive design calls for impressive engineering. 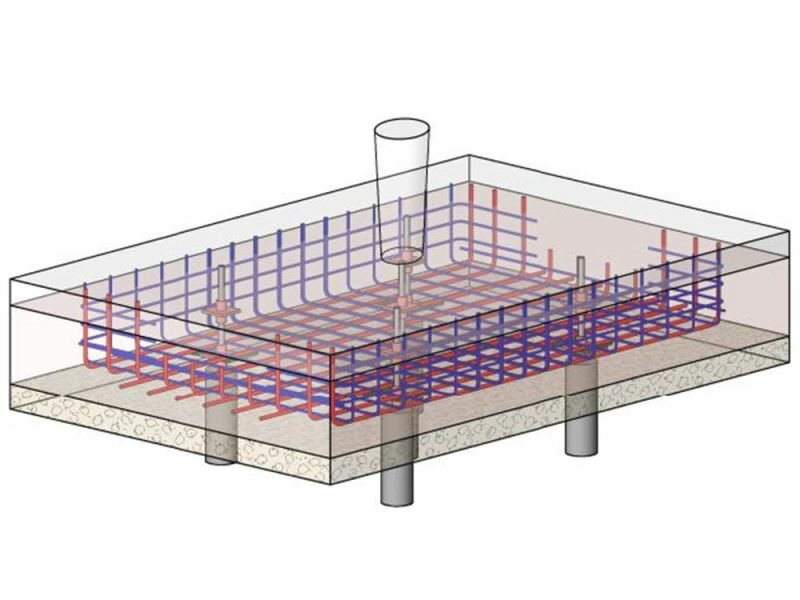 Because of its specialist knowledge ABT was asked by Max Bögl to detail the underwater concrete floor into a project execution plan. An innovative principle was developed on the basis of an integrated basement floor. This means that in the final stage steel fibre reinforced underwater concrete works together with the structural floor to be poured onto it. The required quantity of concrete is reduced, less excavation is necessary and greater distribution of the loads from the superjacent canal is made possible. This balances the upward water pressure below the basement floor and the downward loads from the basement structure and the water in the canal. The result: limited load on piles, enabling the application of slender foundation piles with optimised use of the tensile as well as compressive capacity. Because of the regular construction pattern the way of building shows a lot of repetition. All but two of the 47 reinforcement cages below the central columns are completely identical. The reinforcement cages were modelled in 3D with Revit. Due to this the process from design, through the fine-tuning with divers up to the ordering can be one smooth-running affair. In January 2016 the construction of the car park was started. The process is conducted, under the direction of Max Bögl Nederland B.V., in close cooperation with main structural engineer Van Rossum, geotechnical consultant CRUX b.v., diving company DCN Diving and subcontractors Volker Staal Funderingen, Van Werven Infra and Beens Groep. By checking work plans and performing on-site inspections ABT is also involved in the execution process. It is expected that by the end of 2017 the first cars and bicycles can be parked under the canal.